Today, my friend Amanda is going to share some tips about teaching students how to identify functions. She has experience teaching middle school math and has lots of great tips for Pre-Algebra and Algebra 1. Amanda blogs at Free to Discover and also has a TpT store under the same name. Thank you, Karrie, for giving me the opportunity to share my ideas today! In eighth grade, we learn about identifying functions pretty early in the year. To help my students remember the rule I have a few tricks up my sleeve, and today I’m sharing them with you. I sing it twice then have them join in for a few rounds. In my experience, this has been a fun way to get the definition stuck in their head. Months later when we are studying for the midterm many students still remember the song! At this point, I’ve hooked them in. They don’t understand what they just sang yet, but we fix that by taking some quick notes. We make two columns in our notes. The left we label Function and the right we label Not a Function. I start with a set of coordinates, then tables, then mappings. 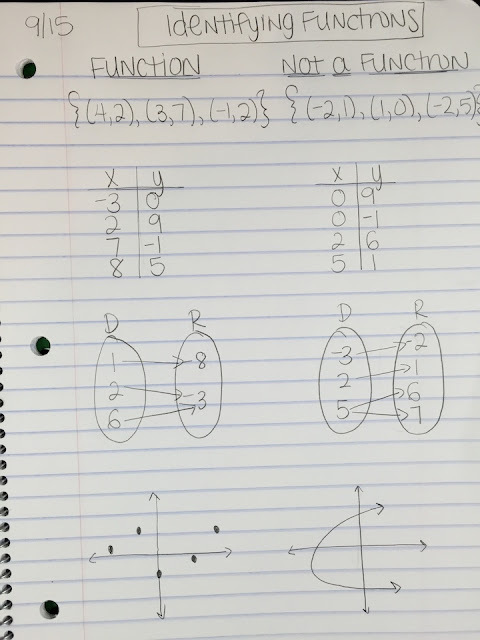 I also make sure I include weird cases like when there are two y values that share the same x value. I can see that many begin to see the pattern and understand. The light bulb expressions go off like popcorn. When we get to graphs, we pause and talk about the Vertical Line Test. We all hold our pencils and talk about the rule. It is so important here to connect it back to the original rule, too. We look at specific coordinates on the graphs, and discuss how the Vertical Line Test is just a visual way of checking the same rule. First, concrete rule-checking is in order. I have an awesome Algebra with Pizzazz riddle that I use here. Students are given a dozen relations represented as sets of ordered pairs, tables, mappings, and graphs. 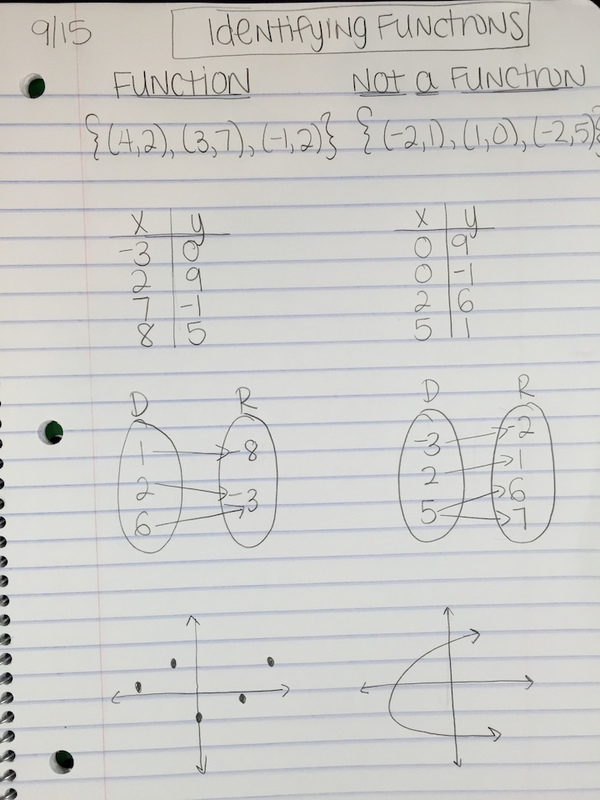 They work quickly through the worksheet to place a check or x based on whether the relation is a function or not. This is a great self-checking exercise and we quickly check together as a group as well. Then, we take out our classroom set of mini-whiteboards and markers for a bit of challenge. I present students with some higher-order thinking practice by having them work backwards. I will say something like, “Make me a table that is NOT a function.” Everyone’s will be different but I can do a quick scan to make sure I see a table with matching x values and different y values. We go through several rounds of this type of practice. These activities hit on a bunch of learning styles and interests and have worked well in my classes. I hope you can take away something new to try! Thanks for reading! I hope you found Amanda's post helpful! Lessons are always more fun when you can incorporate songs or short video clips! Thanks. 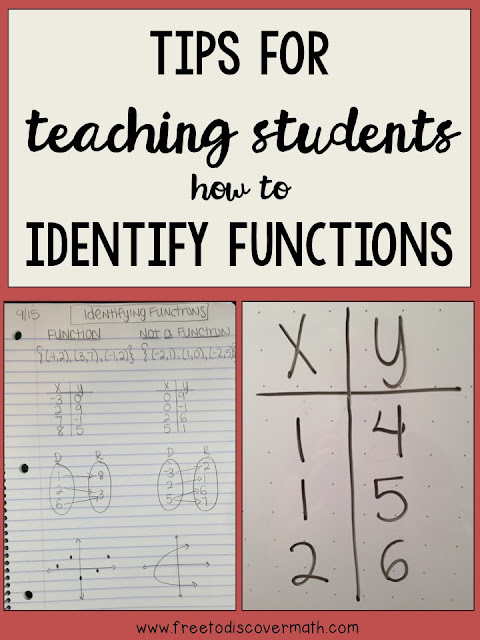 I have started Functions and have in the past struggled with helping students understand the definition. I can't wait to introduce a little Dean into the classroom. thanks for the blog I added a second line...if the vertical line crosses only one time it's a function!